Bellevue’s Newport Shores neighborhood lies on a low floodplain of Coal Creek near Lake Washington. Increased development in the area created more frequent and severe flooding of the neighborhood, due partly to five undersized culverts beneath the major roads. Replacing each culvert with a bridge will improve stormwater drainage and flow to Lake Washington and restore the creek habitat for endangered fisheries. 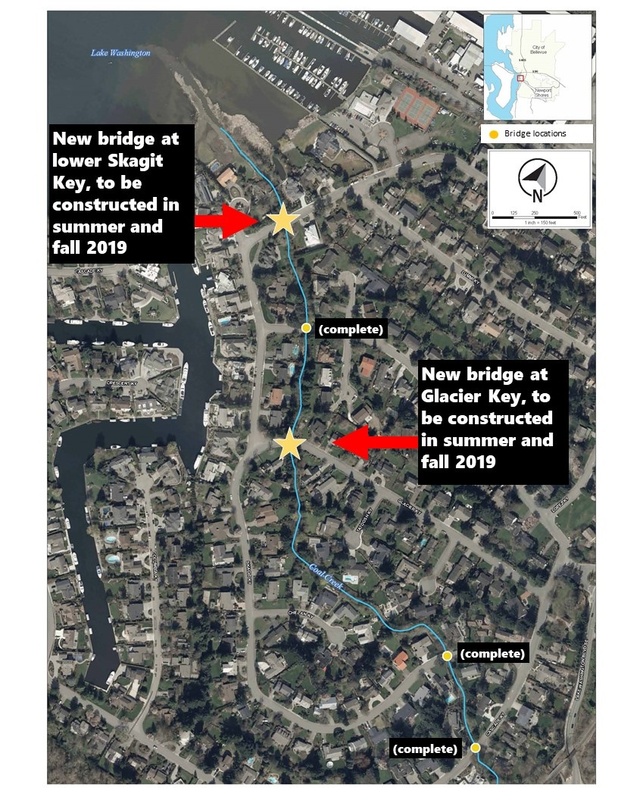 Aspect is providing the geotechnical engineering and construction observation expertise to design and construct the five bridges along with two new stormwater outfalls. Design innovations to evaluate the deep and seismically sensitive soils include state-of-the-art methods developed by the University of Washington to evaluate large-scale lateral spreading acting on bridge foundations and options for reducing lateral loading using new-to-the-region grouted helical piles. Our team worked with the City of Bellevue to select a deep drilled-shaft foundation system and coordinated closely with the City and the other consultants to keep neighborhood residents informed of our work and progress. Aspect also worked with the City to evaluate risks and cost-effectiveness of options for mitigation for settlement of bridge approaches using articulated approach slabs, lightweight fills, and maintenance pavement. Work is progressing, with three of the bridges already constructed and design work on the last two underway. As proof of the project’s effectiveness, salmon returned to Coal Creek this winter, and are now spawning upstream of the recently completed bridges. To meet current engineering standards and improve riparian and aquatic habitat, Aspect is providing geotechnical services for the replacement of a levee and river revetment for a 1.4 mile length of the Lower Russell Road flood protection system along the east bank of the Green River in the City of Kent. The project will improve flood protection for the residents and businesses of Kent, Tukwila, Renton and the Green River valley. Aspect Consulting is the lead geotechnical engineer for the project. They completed field investigations to characterize the subsurface conditions in support of the design and construction of the new levees and ecosystem restoration features. Aspect is completing seepage and slope stability analyses for levee design, and providing geotechnical recommendations for levee embankment material, roads, utilities, and habitat features. The project objectives include designing a system that minimizes long-term maintenance needs and associated costs, and balancing policy directives regarding flood protection (e.g. scour protection, stability and vegetation maintenance), habitat restoration, and recreational use.